The cold water hand washing station is a free standing unit which is feed cold from a tap or hose. 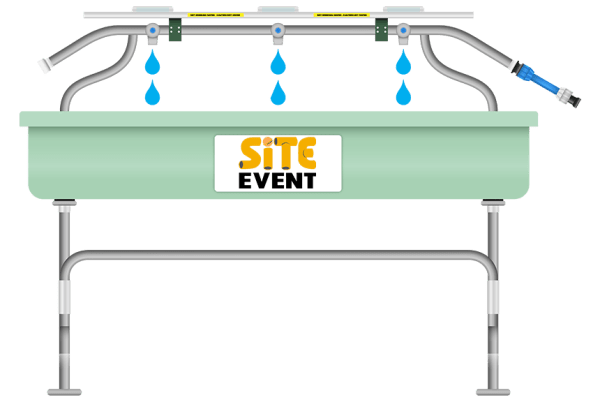 The unit combines six taps, a perfect hand washing station for a large event or an event which requires a high level of cleanliness, particularly around animals or food. The self closing taps ensure water is not wasted and can not be continually run. Site Event can also provide a stand with a soap dispenser which complements this cold water hand washing station. The cold water hand washing station needs a cold water supply to be linked up to the unit for it to work. This can be provided through a hose pipe or directly from a tap. This cold water hand washing station would be a great addition to a busy event to reduce the queuing time, by ensuring people wash their hands outside the unit. Alternatively it would be a hygienic option for an agricultural event to prevent cross-contamination. Site Event can provide skilled labour to plumb the unit in as an additional service for your event. We can also deliver this unit to any event site across the South of England from both of our depots in Hampshire and Kent.